Southern European countries generally have a rich tradition of cheesemaking and Portugal is no exception. 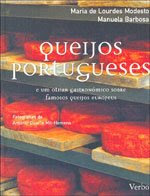 A book on Portuguese cheeses QUEIJOS PORTUGUESES e um olhar gastronómico sobre famosos queijos europeus (Portuguese Cheeses and a Gastronomic Look over Famous European Cheeses) written by Dr Manuela Barbosa, retired from INETI, Lisbon, and M. de L. Modesto is available which discusses this rich tradition. This book received the Award of Gastronomic Literature, 2007, given by the Portuguese Academy of Gastronomy.